They say that in youth, everything seems possible. 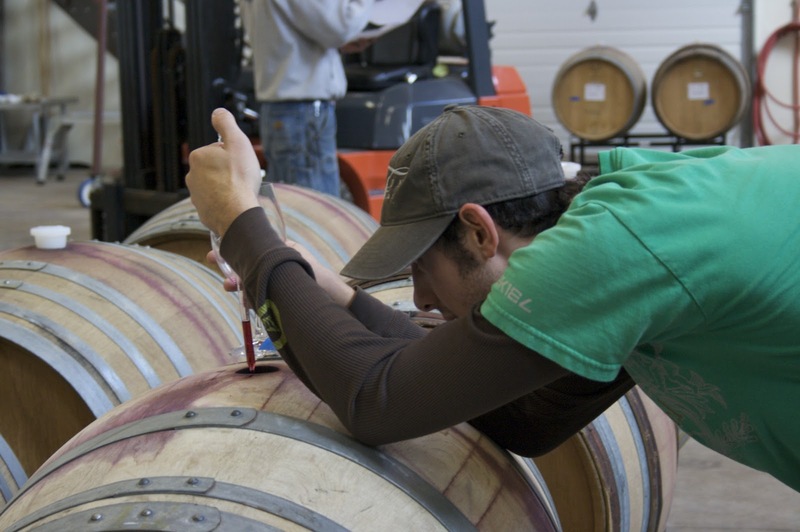 The youngest wine-making operation in Oregon right now believes just that. Christine Collier and winemaker Chris Jiron have taken their sense of possibility and their commitment to the wines of Oregon to the state's southern reaches. They hope in their loyalty to this part of the state and in the creation of their own label, God King Slave wines, that both the region and their wine can become an important part of the Oregon wine conversation. For Christine, Southern Oregon represents opportunity and for Chris it's a return home. For both of them and their commitment and love of Oregon-made wine it presented a much more open door to wine-making than the already crowded Willamette Valley. Chris was drawn to an opportunity in wine production opened at Folin Cellars and Christine saw the region as a perfect place to launch a new label and a new adventure, a dynamic and growing region which can produce quality fruit and interesting wines. As a region it's beautiful and rugged and wide open when it comes to the kinds of wines you can make. As the southern frontier of Oregon wine, Southern Oregon represents tremendous opportunity but it's not without its challenges. For better or for worse, the region does lack some of the seriousness that you find in the Willamette Valley and you still see an excess of retired millionaires who want to own a vanity project winery. On the other side of things, you're also seeing real talent in wine making at Quady North, Cowhorn and Folin Cellars. Southern Oregon is without a doubt though the right place for God King Slave. Chris and Christine are invested and are willing to do whatever they can to help it become a region that reaches its potential. They've also been embraced by the region: Chris is the assistant winemaker at Folin Cellars and Christine does marketing and public relations for Troon Vineyards. "Without Rob Folin, we couldn't do God King Slave," says Christine. Rob hired Chris and has allowed them to get access to fruit and equipment to help get God King Slave off the ground. With the first vintage in the books, the wine style at God King Slave is still evolving. There weren't any gimmicks or trends that drove the decisions about the kind of wines they set out to make. For Chris and Christine it was about making the kinds of wines they appreciated: elegant wines with proper acidity, perhaps an undeniable remnant of their time in the Willamette Valley where Chris studied wine making and Christine worked at Willamette Valley Vineyards. The result is a very intentional approach to the fruit and the wine. "We pick on flavors and not brix. Our red wine for 2010 and 2011 will barely break 13% alcohol, but they don't lack body or character in our eyes." Last year was a cold vintage in Southern Oregon and God King Slave had picked all of their fruit before most folks had even picked their whites. Add to that an adherence to keeping the wood from clobbering the fruit and you have a very neutral oak regiment and a wine that offers a stylistic nod to the Old World. The biggest decision they made, however, was to blend. That wasn't in the plan and so is the result of a happy accident. Christine was cleaning up after some blending trials and poured the Tempranillo in with her Syrah. When they tasted it, they both just knew, but the decision to go with it was a laborious one. Will people really think of this as a blend? Would people think of them as idiots? Could they sell it? Doubts aside, they knew it was their best effort and so they got comfortable with the idea. God King Slave will release a 2011 Sauvignon Blanc in May. Chris spent the last harvest in New Zealand and his fondness for New Zealand's Sauvignon Blancs drove a desire to give the varietal a try. This doesn't necessarily set the direction for God King Slave moving forward. 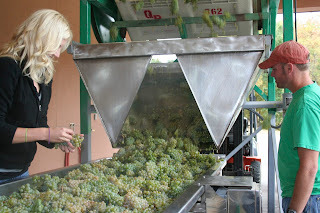 There is a desire to do a white wine and long term a third, yet completely unidentified wine. For Christine offering three different wines gives God King Slave both focus and variety while acknowledging that the goal is to strike a balance between being unique but not so far out there that only the geekiest of wine geeks is interested. For Chris and Christine this is about a commitment and belief in the wine industry. They're not wealthy and that's not the ultimate goal. It's about making a living doing what they love, which is making wine. That financial reality can making it challenging to grow in production size and so they're doing what they can for now. They'll go up in production from 2011 to the 2012 vintage by 80 cases to get them to 250. It's a slow process but they're not looking for short cuts and are realistic about their limitations. The goal, make the best wines they can, stay true to potential of Southern Oregon and make something that people will be impressed by and interested in. Writing about God King Slave, the name itself feels like an "elephant in the room." The inclusion of the terms God and Slave may make you uncomfortable. The name comes from a quote by the sculptor, Constantin Brancusi, and the intention was never to push people's comfort levels. The renowned artist is known as the patriarch of modern sculpture and the complete quote is "Create like a god, command like a king, work like a slave." The quote resonated with Chris and after a lot of coaxing he won Christine over. I can see how people are made uncomfortable by it, yet Christine says "To me it's less offensive than a winery named after someone's daughter or a stream the runs through their property. It stands for something, which is a lot more than most brands do." Split down the middle a Tempranillo and Syrah blend that delivers dried figs, black cherry reduction, dust, and smoky, meaty aromatics. The wine is absolutely lovely, with fantastic structure and the low alcohol speaks volumes about what can be done without overripe fruit when it comes to Tempranillo, which is far too rare these days. There's loads of fruit, and no wood to be found on this wine. The flavors mingle beautifully with plums, clove, and herbal notes. A proper amount of acidity delivers a lasting finish, it makes me think of some Spanish blends I've had or even aromatically of a Minervois. I didn't know a thing about Constantin Brancusi before I researched this piece, but I think another of his quotes is in order, "Don't look for mysteries, I bring you pure joy." If you enjoy real wine, appreciate elegance, and don't look for over-ripe flavors, you'll be impressed by the God King Slave. Only 90 cases were produced and only $26 is an incredible price for a wine this good.